The Armstrong Browning Library prepares two or three major exhibitions each year, drawn from its own collections of letters, manuscripts, books from the Brownings' personal library, and other rare materials housed in the Library. Several of the exhibitions are available as digital editions on the ABL&M Blog. Please click here to view these additional pages. In addition to the unparalleled collection of correspondence written and received by the Victorian poets Robert Browning and Elizabeth Barrett Browning, the Armstrong Browning Library houses a large collection of Victorian letters and manuscripts connected to other prominent and lesser known British and American figures. This collection includes letters and manuscripts from many notable nineteenth-century literary figures such as Charles Dickens, William Wordsworth, Samuel Taylor Coleridge, Thomas Carlyle, John Henry Newman, George MacDonald, and John Ruskin. The collection also includes letters and manuscripts from the fields of science, exploration, religion, politics, the arts, music, and the theater. The letters and manuscripts in this growing collection, which currently contains over 3,000 items, has been digitized and can be browsed and searched by date, author, keyword, or first line of text at the Baylor University Libraries Digital Collection. Can a child be an orphan if her parents are alive? Yes, Elizabeth Barrett Browning (EBB) claims in The Cry of the Children (1843). EBB wrote this poem in response to shocking government reports about child labor in mines and factories. She opens asking British readers to hear a cry for relief coming through the reports: "Do ye hear the children weeping, O my brothers?" EBB invites readers to see themselves as "brothers" in a national family that has ignored the cries of its working children, abandoning them as "orphans of earthly love." Only one letter stands between "hear" and "heart." EBB asks readers to take the cry they hear in her poem to heart; not acting will crush hearts. 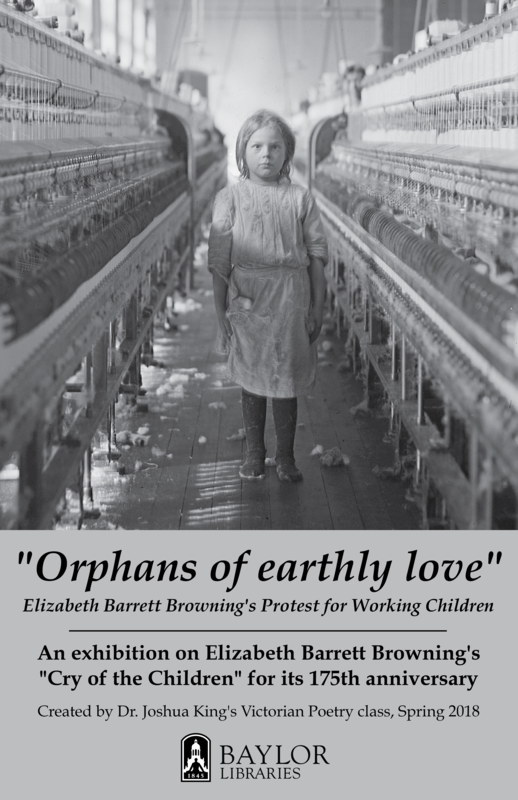 "How long," EBB imagines the children asking their nation, "will you" trample each "child's heart" to pursue your profit? We hope you'll join us in considering these questions as you journey through our exhibition. The Oceanic Steam Navigation Company, more commonly known as the White Star Line, was a prominent British shipping company. Founded in 1845, The White Star Line, operated a fleet of clipper ships that sailed between Britain, Australia, and America. The ill-fated Titanic was perhaps their most famous ship. 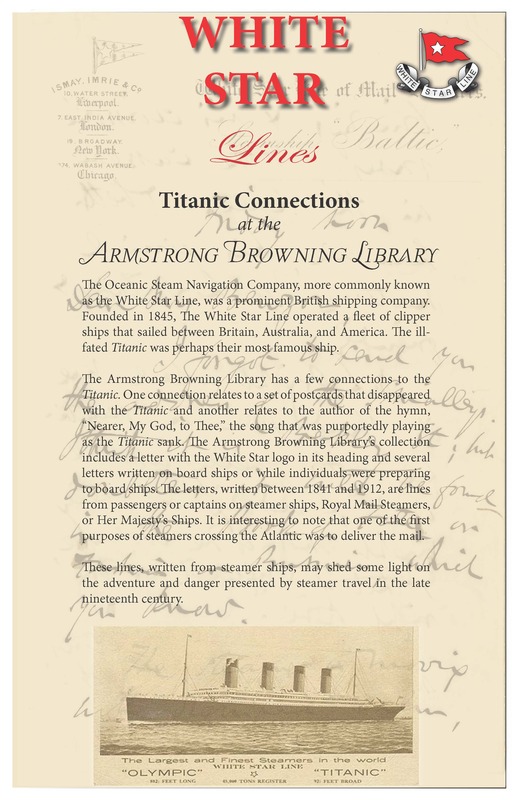 The Armstrong Browning Library has a few connections to the Titanic. One connection relates to a set of postcards that disappeared with the Titanic and another relates to the author of the hymn, “Nearer, My God, to Thee,” the song that was purportedly playing as the Titanic sank. The Armstrong Browning Library's collection includes a letter with the White Star logo in its heading and several letters written on board ships or while individuals were preparing to board ships. The letters, written between 1841 and 1912, are lines from people who were passengers on SS (Steamer Ships), RMS (Royal Mail Steamers), or HMS (Her Majesty’s Ship). It is interesting to note that one of the first purposes of steamers crossing the Atlantic was to deliver the mail. These lines, written from steamer ships, may shed some light on the adventure and danger presented by steamer travel in the late nineteenth century. “The image of a ‘solitary genius’ creating art in isolation has been handed down to us from the Romantics; this is ironic because the nineteenth century boasts some of the most fascinating relationships between famous literary figures. 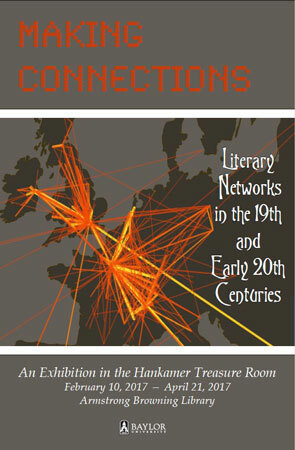 Authors did not, in fact, work alone but often collaborated, either directly by each person contributing something to the final piece or indirectly through the influence of conversations, interactions, or from reading one an­other’s works.” In Fall 2017, students in Dr. Kristen Pond’s upper-level Eng­lish course, “Literary Networks in the Nineteenth and Early Twentieth Centuries,” explored the relationships between writers of the Romantic, Victorian, and Modernist Periods. Utilizing the letters, manuscripts, rare books, and other collection materials at the Armstrong Browning Library, the students ended their semester by curating an exhibition that uncovered con­nections between one particular literary figure and Robert and Elizabeth Barrett Browning—the centers of the literary network for the course—or an­other significant literary figure. Perceptions and relationships act like gravity, secretly guiding how we move through the world. Which of us does not feel the pull of these questions— How do others see me and the world around us? How do they see those I love or admire? How will we be remembered when we are gone? These same questions, this exhibition reveals, shaped the lives and legacies of important British Romantic authors and the writers who followed them. Sisters nurtured the social standings of their brothers, friends revealed their tensions in their publications, sons wrote their way out from under the literary shadows of parents, and widows curated the memories of husbands. Yet perceptions and facts rarely—if ever—perfectly coincide. Consider the image we have chosen for our exhibition, a famous painting of the funeral of Percy Shelley, a Romantic poet who tragically drowned at twenty-nine. It includes many of the people you will meet in our display cases. Nearly every detail—Shelley's body rests immaculate on the pyre; the poet Lord Byron stares into the distance in the foreground; Shelley's wife Mary kneels grieving in the background—is inaccurate. Shelley's body was disfigured by the sea, Byron was shocked and sought relief in a swim, and Mary was not present. Yet this painting still shapes the way people around the world view Shelley, his death, and those who loved him. As you see our displays about these and other authors, ask yourself: how are my perceptions of these authors, and their relationships, being shaped? 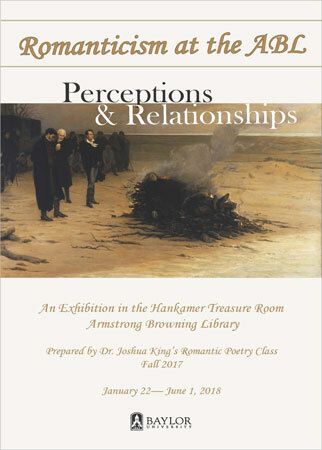 An exhibition created by students in Dr. Joshua King's Romantic Poetry class, fall 2017. You will never see the discarded drafts of this introduction. What were they like? What response was the author hoping to achieve through that revision? Will the next reader react to these words the same way you are? When words are printed and public, we tend to forget that they could have been different, and that two people rarely read them the same way. This exhibition invites you to wonder why important Victorian poets discarded so many of their first attempts, and what this says about their concern for their reception and public image. These poets were not the only ones revising: readers gave diverse meanings to their poems, and editors arranged their poems in ways that shaped how they were interpreted. The poets themselves were revised as reviewers and artists influenced their public perception. What revisions will you notice, what new interpretations will you create, as you journey through the exhibition? In fall 2016, students in Dr. Kristen Pond’s upper-level English course, “Literary Networks in the Nineteenth and Early Twentieth Centuries,” explored the relationships between writers of the Romantic, Victorian, and Modernist Periods and the influences they had on each other’s works. “Authors did not, in fact, work alone,” Dr. Pond argued, “but often collaborated, either directly by each person contributing something to the final piece or indirectly through the influence of conversations, interactions, or from reading one another’s works.” Utilizing the letters, manuscripts, rare books, and other collection materials at the Armstrong Browning Library, the students ended their semester by curating an exhibition that uncovered connections between one particular literary figure and Robert and Elizabeth Barrett Browning—the centers of the literary network for the course—or another significant literary figure. Marcus Appleyard, Rebecca Causey, Victoria Corley, Annie Dang, Taylor Ferguson, Casey Froehlich, Madelynn Lee, Mollie Mallory, Anne McCausland, Emily Ober, Shannon Ristedt, Chris Solis, Alexander Stough, Alex Ueckert, Baylee Versteeg, and Jonathan White. This year marks the 400th anniversary of William Shakespeare's death, which occurred on April 23, 1616. In recognition of this important anniversary, the Armstrong Browning Library presents this exhibit showcasing ten rare eighteenth-century editions of Shakespeare's works. These editions are part of the Stokes Shakespeare Collection which was donated to the ABL by William N. Stokes, Jr., a former student of the library's founder, Dr. A.J. Armstrong. The editions exhibited here represent a significant period in Shakespearian scholarship. The eighteenth century saw a series of editors produce successive editions of Shakespeare's works. As the century progressed, ideas about authorship, in general, and Shakespeare, in particular, changed. There was increased significance placed on the preservation of texts in their original versions. Shakespeare himself published none of his own plays, and the earliest editions of them, published after his death, contained errors introduced by compilers, printers, and compositors. Despite these challenges, several eighteenth-century editors attempted to approximate Shakespeare's genuine text, each bringing their own unique style to the work. Each edition is different, making them interesting to examine individually and as a whole collection. 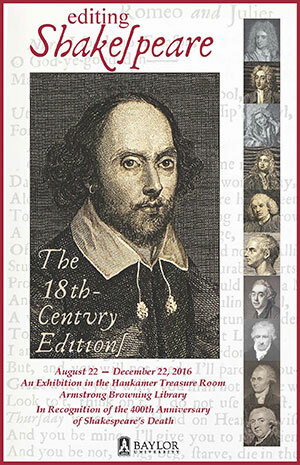 The editorial changes introduced in these volumes both reflected and contributed to a gradual cultural sanctification of Shakespeare and canonization of his words. Viewers of this exhibit are encouraged to reflect on the weighty cultural and literary significance of these editions. —This exhibit was curated by ABL intern Hannah Schwartz, a junior University Scholar with concentrations in linguistics and English literature. The 2015 Baylor Libraries Symposium, “Alice at 150,” held October 6th through 9th, recognized the 150th anniversary of the publication of the children’s classic Alice’s Adventures in Wonderland, authored by Charles Lutwidge Dodgson using the pen name Lewis Carroll. When the symposium theme was announced, it brought to mind a project I had been considering for some time—an inventory of children’s literature held by the Armstrong Browning Library. In the development of ABL’s book collection, children’s literature has never been a focus. The only items actively collected in this area have been editions of Robert Browning’s poem “The Pied Piper of Hamelin.” I knew, however, that other books for children were in the collection. After extensive searches of the Baylor University Libraries’ Online Catalog, using keywords and subject headings related to literature for children, I was shocked at the number of titles located at the ABL. In addition to the over 150 editions of The Pied Piper of Hamelin, I uncovered over 240 other children’s literature titles. 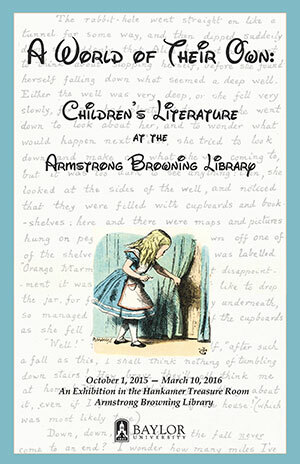 So, not only are we recognizing Lewis Carroll and 150 years of Alice, we are celebrating the discovery of a hidden collection by presenting this exhibition, A World of Their Own: Children’s Literature at the Armstrong Browning Library. 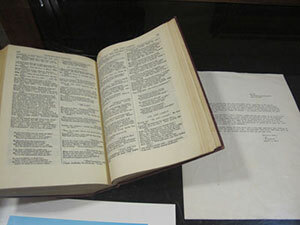 Included among the books, tracts, and pamphlets in this exhibition are fables, children’s classics, children’s literature by famous authors, instructional literature, and poetry for children. As the nineteenth century progressed and literacy achieved new heights, publishers began to recognize the financial benefits of providing books for children, particularly for the Christmas and Easter markets. Children’s literature, as a genre, began to reach maturity. The books offered for children began to include not only instructional materials, but some, like Alice’s Adventures in Wonderland, that opened a world of nonsense, fantasy, or adventure—a world of their own—to the children of the period. Visit A World of Their Own online. 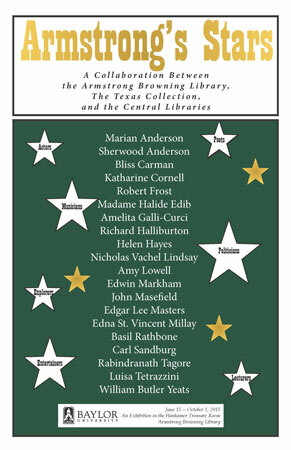 Armstrong’s Stars, a collaboration between the Armstrong Browning Library, The Texas Collection, and the Central Libraries, highlights this memorable part of Baylor’s history. A companion blog series, available on the Armstrong Browning Library’s and The Texas Collection’s blogs, features additional details about some of the most famous individuals who visited Baylor. Contributions to the blog series were made by Armstrong Browning Library and Texas Collection staff as well as by students in the English Department, some of whom are also members of Baylor’s chapter of Sigma Tau Delta, the English honor society. Dr. Armstrong founded Baylor’s chapter of Sigma Tau Delta in 1925 and that group sponsored many of these exciting events and ensured their success. When Harriet Beecher Stowe (1811-1896), abolitionist and author of Uncle Tom's Cabin, met Abraham Lincoln at the White House in 1862, the president is said to have welcomed her by saying, "So you're the little woman who wrote the book that started this Great War!" But Stowe was not alone. As the Baylor University Libraries observe the 150th anniversary of the end of the Civil War by mounting exhibits under the overarching theme "with charity for all," taken from President Lincoln's Second Inaugural Address, the Armstrong Browning Library's exhibit Imagining Charity for All highlights works by some of the men and women who, like Stowe, used their literary talent to promote freedom and equality. The items on display from the collection of the Armstrong Browning Library represent a small, but powerful, portion of the large body of anti-slavery writings produced prior to and during the Civil War that furthered the cause of ending slavery. Scholars know the Armstrong Browning Library at Baylor University as a world-class research library devoted to the lives and works of Robert and Elizabeth Barrett Browning. In addition to housing the world’s largest collection of books, letters, manuscripts, and memorabilia related to the Brownings, the library houses a substantial collection of primary and secondary materials related to nineteenth-century literature and culture. The Victorian Letters and Manuscripts Collection includes almost 2,500 items from literary, political, ecclesiastical, scientific, and cultural figures in the nineteenth century. Letters, manuscripts, and books from numerous Victorian figures were featured in the exhibit. 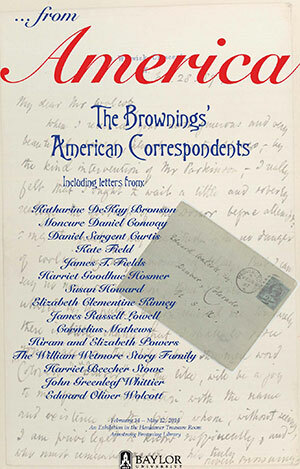 A digital edition of "Beyond the Brownings" is available on the ABL&M blog. The cataracts and mountains you speak of have been, are, mighty dreams to me "and the great people which, proportionate to that scenery, is springing up in their midst to fill a yet vaster futurity, is dearer to me than a dream. America is our brother-land, and though a younger brother, sits already on the teacher's seat, and expounds the common rights of our humanity. It would be strange indeed if we in England did not love and exult in America--if English poets, of whom I am least if at all, did not receive with peculiar feeling of gratitude and satisfaction the kind welcoming word of American readers. Believe me grateful to America" . . . .
We have one Shakespeare between us--your land and ours--have we not? And one Milton, and now we are waiting for you to give us another. . . .
You would wonder a good deal--but would do so less if you were aware of the seclusion of my life, when I tell you that I never consciously stood face to face with an American in the whole course of it. I never had any sort of personal acquaintance with an American, man or woman. Therefore you are all dreamed dreams to me "Gentle dreams" I may well account you. In fact, Elizabeth and Robert Browning did meet many Americans face to face. Their American acquaintances included publishers, editors, journalists, poets, novelists, socialites, sculptors, painters, actresses, social activists, and politicians. Although Elizabeth and Robert never traveled to America, they corresponded with these American friends and met many of them socially in their home in Italy and during their stays in England and Europe. A digital edition of ". . . from America" is available on the ABL&M blog. This excerpt from a fragment of the poem, "My sisters! Daughters of this fatherland," by Elizabeth Barrett Browning, expresses the challenges Barrett Browning faced as she sought to assert her voice in a predominately male tradition of public poetry in the 1840s. 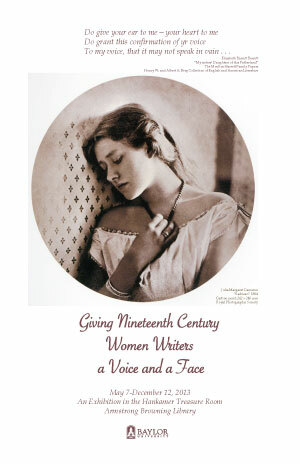 The Giving Nineteenth Century Women Writers a Voice and a Face exhibit featured texts and images of twenty-three nineteenth-century women. These women were mothers, daughters, wives, lovers, friends, poets, novelists, tract writers, storytellers, hymn writers, advocates for social reform, philanthropists, and more. Women writers included in the exhibit were Hannah More, Maria Edgeworth, Felicia Hemans, Mary Shelley, Mary Russell Mitford, Anna Jameson, Letitia Elizabeth Landon, Sarah Flower Adams, Elizabeth Gaskell, Geraldine Jewsbury, Eliza Cook, Julia Margaret Cameron, Isabella Blagden, Theodosia Trollope, George Eliot, Jean Ingelow, Anne Thackeray Ritchie, Lucy Larcom, Christina Rossetti, Frances Ridley Havergal, Julia Augusta Webster, Amy Levy, and Michael Field. Because Victorian women were expected to find fulfillment in marriage and children, typical nineteenth-century women's writing included children's literature, flowery poetry, and religious poems. However, these works, important in themselves, also gave nineteenth-century women a platform for speaking to gender inequality and social reform. Some women writers of the period broke from convention and also produced literature similar to their male counterparts, such as novels and dramatic works. Some were well liked by the public and respected by their fellow authors, both male and female. Most of the nineteenth-century English writers were well acquainted with one another. They communicated frequently and critiqued each other's works. Many literary individuals were even related, by blood or by marriage. Robert Browning and Elizabeth Barrett Browning were both in close contact with their contemporaries and the Browning's personal library included works from many of these authors. 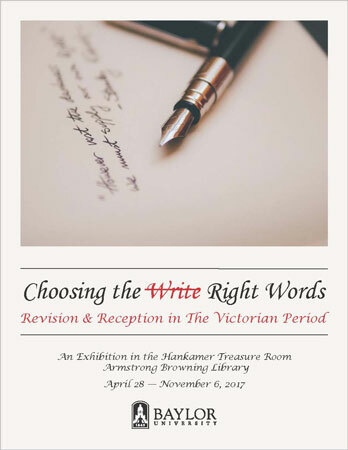 Many of the items in the exhibit were drawn from the Armstrong Browning Library's large 19th Century Women Poets Collection, which embraces a range of styles, from simple statements to effusive eulogies. Topics covered include religious themes, ancient Greek and Roman myth, daily life, romance, motherhood, social issues, and local and national history. The 19th Century Women Poets Collection has been digitized and can be viewed online at https://digitalcollections.baylor.edu. A series of posts on the ABL&M blog details the many fascinating facts that were discovered about these amazing women during the research for the exhibit. 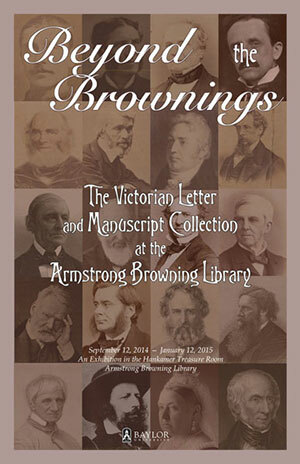 It is the Armstrong Browning Library's sincere hope that through these texts and images that we are able to honor Elizabeth Barrett Browning's wish by giving nineteenth-century women writers a voice and a face. In conjunction with the other libraries at Baylor University, the ABL 2013 spring exhibit complemented the theme Middle East Patterns: Places, Peoples, and Politics. The Middle East Patterns exhibit extended beyond the ABL and included Moody Memorial Library, The Texas Collection, and the W. R. Poage Legislative Library. The entire exhibit featured over 300 original photographs from Dr. Colbert C. Held, a 1938 alumnus of Baylor, former Foreign Service Officer with the State Department, and retired diplomat-in-residence at Baylor University. Held took more than 19,000 photographs that portray the people and culture of this area. 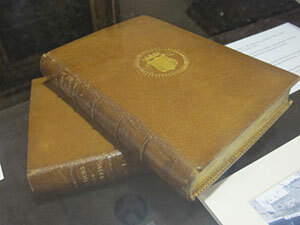 Prominently displayed was the textbook used by Colbert Held when a student in Dr. A. J. Armstrong's Browning class. The two kept in touch regularly until Dr. A's death in 1954, a fact made evident by Dr. Held's letter written in 1949. The textbook is shown open to a section of Ferishtah's Fancies, a poem that inspired a series of stained glass windows on the third floor of the Armstrong Browning Library. Two of the windows portray scenes from "Mihrab Shah" and "The Melon Seller," which are sections of Ferishtah's Fancies. On several occasions Robert and Elizabeth Barrett Browning expressed a desire to visit the Middle East, in particular Egypt and the Holy Lands. The couple made tentative plans to travel to Egypt in the winter of 1858, but never made this trip. Though unable to travel to the Orient, Robert Browning met the Shah of Persia, Jasir al-Din Shah Qajar, on two different occasions, in the summer of 1873 and the summer of 1889. On the first occasion, Browning was invited to a gala dinner in honor of the Shah, which was held at the Duke of Sutherland's home. Guests were seated by rank; and Robert Browning, who had no title, was far down at the end of the table. The Shah noticed Browning in his bright red robes from Balliol College and inquired about his identity. When told Browning was one of England's great poets, the Shah announced that in Iran poets were honored; he demanded that Browning sit next to him. The Duke acquiesced, moving the poet next to the Persian monarch and the Prince of Wales, while he moved to the end of the table. Browning was distressed about this social faux pas and went to his publisher where he requested that two volumes of his Selections be specially bound and stamped with the Sutherland crest. Browning sent the volumes to the Duke as an apology. In 1927 the volumes were presented to Dr. Armstrong by the Duchess of Sutherland. Middle Eastern influences can also be seen in Browning's furniture selections. An example is the Persian table in the Hankamer Treasure Room. In April of 2011 over 100 rare and ancient Bibles from one of the world's largest collections of Bibles and related documents of the Judeo-Christian tradition were on display to enhance the international conference, The King James Bible and the World It Made, 1611-2011. Sponsored by The Green Collection. Mrs. Browning is in many respects the correlative of her husband. As he is full of manly power, so she is a type of the most sensitive and delicate womanhood. She has been a great sufferer from ill health, and the marks of pain are stamped upon her person and manner. Her figure is slight, her countenance expressive of genius and sensibility, shaded by a veil of long brown locks, and her tremulous voice often flutters over her words, like the flame of a dying candle over the wick. I have never seen a human frame which seemed so nearly a transparent veil for a celestial and immortal spirit. . . . A union so complete as theirs--in which the mind has nothing to crave nor the heart to sign for--is cordial to behold and soothing to remember. 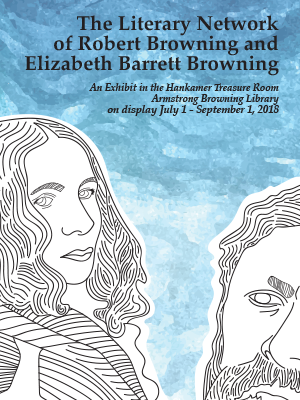 The items in this exhibit emphasized the petite and diminutive presence of Elizabeth Barrett Browning--the bronze sculpture of her frail hand clasped in the palm of her husband's, the tiny mitts she wore, her personal teapot, the miniature books she cherished, her fragile handwriting illustrated by the famous "How Do I Love Thee?" (Sonnet 43, Sonnets from the Portuguese)--along with the pencil and ink well she used to produce her poetry. All of these relics are available for the public to view. 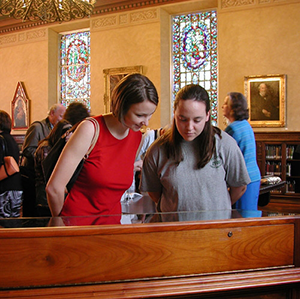 A sampling of memorabilia concerning the Brownings, their families, and closest friends is exhibited in the John Leddy-Jones Research Hall and the Hankamer Treasure Room. The display of these personal items adds a third dimension to the study of the Brownings' lives and works. 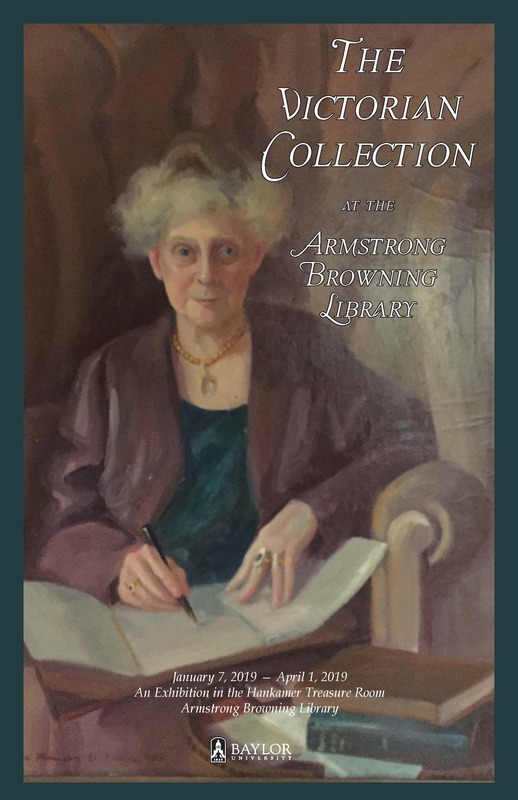 Memorable events in the life of the great founder of the Armstong Browning Library, A. J. Armstrong, are featured in this exhibit of photographs and memorabilia. The third-floor hallway is lined with 31 reproductions of paintings and photographs of Robert Browning from his early manhood through later likenesses of 1889. A selection of current, non-rare books recently added to the collection indicates the depth of research materials available in the Armstrong Browning Library.